This is a 50 foot by 125 foot south end of parcel of address 1904 First Ave. The lot is designated R-3 and qualifies for short term rentals. Property is located within the City limits of Fernandina Beach. The location is one block away from Fletcher Avenue (the main beach road) and would offer an ocean view from the 2nd and 3rd floors of a newly constructed home. 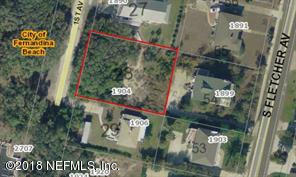 Just north of Sadler Rd, this premium, buildable lot is centrally situated on the center of Amelia Island.